Residing in this bustling city that never stops moving, neither slumbers nor rests. Beneath its concrete jungle exterior and magnificent skyscrapers, this city pulsates with a vibrant energy and a heartbeat – a life force of its own. Here is where we celebrate with good music, good friends and good vibes! 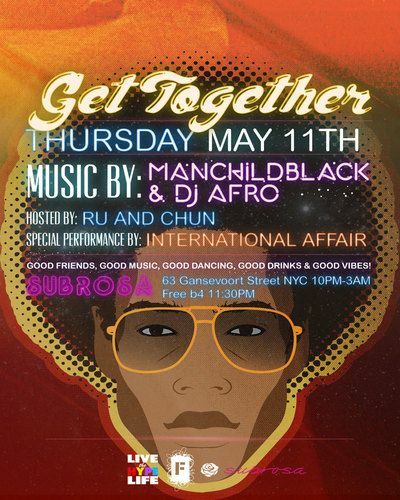 On Thursday, May 11th, let's GET TOGETHER NYC at Meatpacking District hotspot SUBROSA!!! MANCHILDBLACK (The Illustrious Blacks) & DJ AFRO (Los Amigos Invisibles) will spin the best in Funk, Soul, Disco, Afro and Latin influenced dance music to keep you on the floor all night long. RU & CHUN will be on hand to host the nights festivities, plus dance trio INTERNATIONAL AFFAIR will give an electrifying live performance. Good friends, good music, good dancing, good drinks and good vibes..let's get together!